This collection of forty new essays, written by the leading scholars in adaptation studies and distinguished contributors from outside the field, is the most comprehensive volume on adaptation ever published. Written to appeal alike to specialists in adaptation, scholars in allied fields, and general readers, it hearkens back to the foundations of adaptation studies a century and more ago, surveys its ferment of activity over the past twenty years, and looks forward to the future. It considers the very different problems in adapting the classics, from the Bible to Frankenstein to Philip Roth, and the commons, from online mashups and remixes to adult movies. It surveys a dizzying range of adaptations around the world, from Latin American telenovelas to Czech cinema, from Hong Kong comics to Classics Illustrated, from Bollywood to zombies, and explores the ways media as different as radio, opera, popular song, and videogames have handled adaptation. Going still further, it examines the relations between adaptation and such intertextual practices as translation, illustration, prequels, sequels, remakes, intermediality, and transmediality. The volume’s contributors consider the similarities and differences between adaptation and history, adaptation and performance, adaptation and revision, and textual and biological adaptation, casting an appreciative but critical eye on the theory and practice of adaptation scholars—and, occasionally, each other. 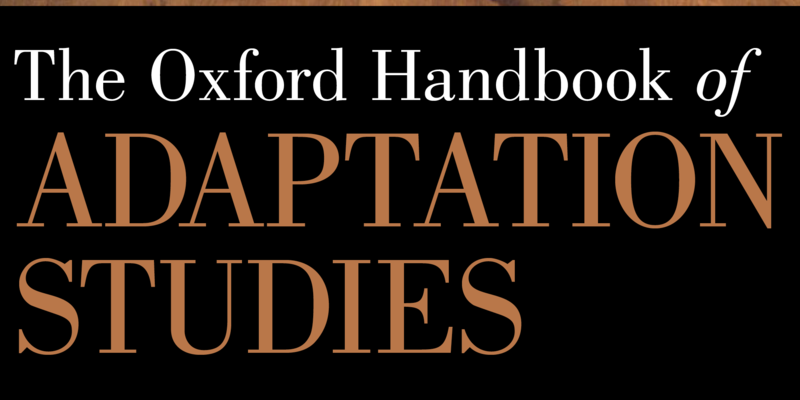 The Oxford Handbook of Adaptation Studies offers specific suggestions for how to read, teach, create, and write about adaptations in order to prepare for a world in which adaptation, already ubiquitous, is likely to become ever more important. Read more about The Oxford Handbook of Adaptation Studies here. Access the online Oxford Handbook of Adaptation Studies here.